Chicken Seekh Kebab with Malted Mango Chutney and Quick Pickled Cauliflower. Well that’s quite a title isn’t it? This post is three recipes in one, all ready in under 15 minutes. Street food at its best. Make all three parts for an easy weeknight meal or just throw together your own mango chutney to turn curry night in to a showstopper. The choice is yours. I love kebabs as a rule, but seekh kebabs are one of the best in my opinion. The night before I went to Silo in Brighton, I booked a table at a restaurant and ate the most incredible seekh kebab there, solo. Table for one. I can’t begin to tell you how boring it is eating out alone but the kebab was so incredible that for once, I didn’t care. I sat with my notebook and made a list of everything I could taste in it, vowing to recreate it as soon as I got home. That’s the seekh kebab recipe I have for you today. It’s fresh and zingy with the right amount of heat. It takes 15 minutes from start to finish and you can make the mix a day or two before, for an ultra quick meal. Wrap in a pillowy naan with homemade mango chutney and some pickled cauliflower. Devour. Why cauliflower? Well cauliflower is everywhere in Pakistani and Indian cuisine, but it wasn’t actually introduced until 1822, when we Brits cultivated a special variety that could withstand the heat. Little did we know how perfectly it would lend its self to the currys, bhajis and parathas that are now staple recipes. Cauliflower was often preserved in pickles to last through the seasons which is where British piccalilli got its inspiration from. Whilst I do love a proper pickle, I’ve used a quick pickling method in this recipe to preserve the natural heat of raw cauliflower, bringing a peppery note to these seekh kebabs and a refreshing crunch. I’m using two types of Sarson’s vinegar in this recipe; the pickling malt for the cauliflower and normal malt for the mango chutney. You can use standard malt vinegar for both but you won’t get the gorgeous spices that come pre-infused in the pickling version. Although mango chutney is normally made with white vinegar, the tangy malt vinegar works amazingly well. The whole thing is made in a jug in the microwave in six minutes flat, rather than hours of watching it boil away on the stove. It’s a wonderful cheat to have in your toolkit and I really can’t tell the difference between my quick version and the real deal. I hope you enjoy this recipe if you try it out. It’s a weeknight staple in our house and I hope it becomes one in yours too. Peel the mango and remove the stone. Dice the flesh into small cubes, around 0.5cm. Combine the ingredients in a microwave safe jug or bowl. Cover the top with clingfilm. Microwave on full power for 5 minutes, stirring half way. Remove the cling film and leave to cool. Sprinkle over the sugar then pour over the malt vinegar. In a large mixing bowl, combine all the ingredients. Knead with the hands until the mince holds together well. If the mix is too dry, add 1 tsp oil or 1 tsp flour if too wet. Preheat the grill to 200 degrees Celcius. Layer in the chutney, pickled cauliflower, cucumber and tomato. Garnish with coriander. Serve immediately. 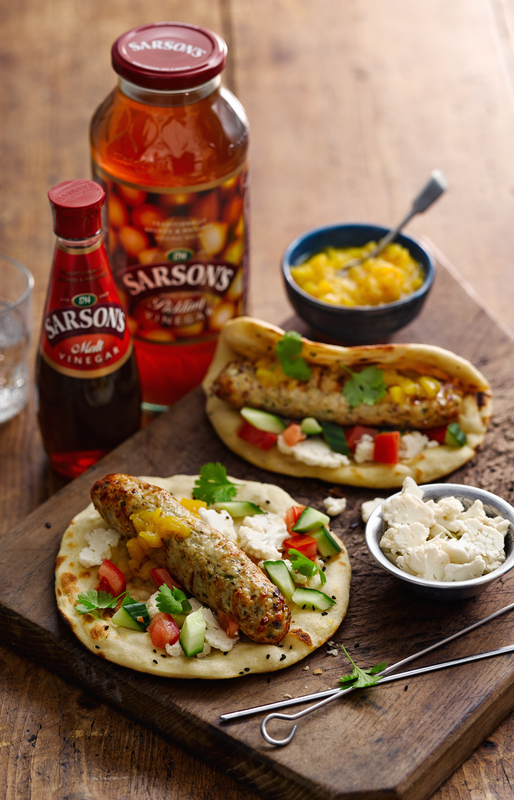 This recipe was commissioned by Sarson’s vinegar to be used in their press campaigns. This really does look and sound amazing. I’ll definitely give this a go! Omgggg. Please come and cook for me. I will provide you with average tunes and a horrible attempt at small talk.